Nice apartment, good location, clean and comfortable. Great apartment, just what we were hoping for. This luxurious two bedroom apartment in Barcelona, located in a new building in the Sants district, is the perfect choice for your Barcelona getaway. This area offers visitors a great experience just outside the hustle and bustle of the city centre, whilst still being well connected by public transport. Nearby to the apartment you will find Barcelona’s main train station Sants. A short stroll away you will find the beautiful Plaça Espanya and the spectacular Magic Fountains of Montjuïc. Las Arenas, an old bullring that was recently converted into a shopping center, is also close by. Less than one minute away you will find the Hostalfrancs Metro Station. This apartment is also very near to the Fira de Barcelona exhibition center. This apartment maintains a chic and modern design throughout. It consists of two double bedrooms sharing a quiet balcony, one bedroom has a double bed and the other has one single bed and one single sofa bed. A single sofa bed can also be found within this lovely apartment meaning it can sleep up to 6 guests comfortably. The living area is spacious with a comfortable sofa and TV, this creates the perfect space to unwind after a day of exploring the city. An Internet connection is also included. From this room, guests will have direct access to the balcony. The apartment features a fully-equipped kitchen making it easy to whip up some delicious home cooked meals with all the utensils required. A Nespresso coffee maker can be provided upon request allowing you to enjoy your mornings on the balcony with a cup of coffee! 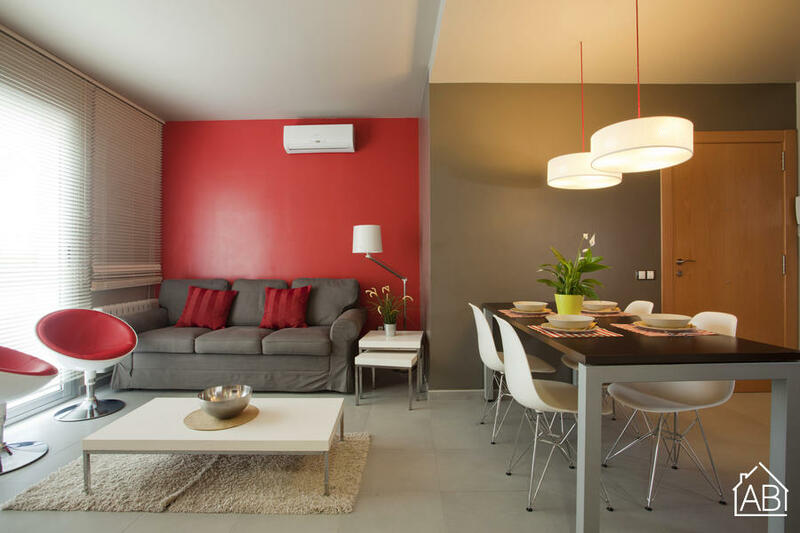 This apartment is also equipped with air conditioning and heating for your convenience. This modern and chic apartment in Barcelona is the perfect home-away-from-home for your trip to the Catalan capital.